In line with Kia’s aim to create innovative cars that are affordable for a broad range of buyers, EcoDynamics+ mild-hybrid technology offers a compelling cost-to-performance ratio compared to full hybrid powertrains. The compact nature of the components means the technology can be integrated into existing vehicle and powertrain architectures without impacting practicality or packaging. Kia’s mild-hybrid powertrain is designed to fit seamlessly into consumers’ lives, with no plug-in recharging required. The Kia Sportage will be the first model to offer the new EcoDynamics+ diesel mild-hybrid powertrain later in 2018. The all-new third-generation Kia Ceed will be the second among a range of Kia models to offer the new powertrain from 2019. The EcoDynamics+ diesel mild-hybrid powertrain will enable Kia to offer cleaner diesel engines. The system is paired with Kia’s Selective Catalytic Reduction (SCR) active emissions control technology, reducing CO2 emissions by up to four per cent on the new Worldwide harmonized Light vehicles Test Procedure (WLTP), and up to seven per cent on the New European Driving Cycle (NEDC)*. The roll-out of diesel mild-hybrid technology will contribute to the brand’s global efforts to improve whole-fleet fuel efficiency. 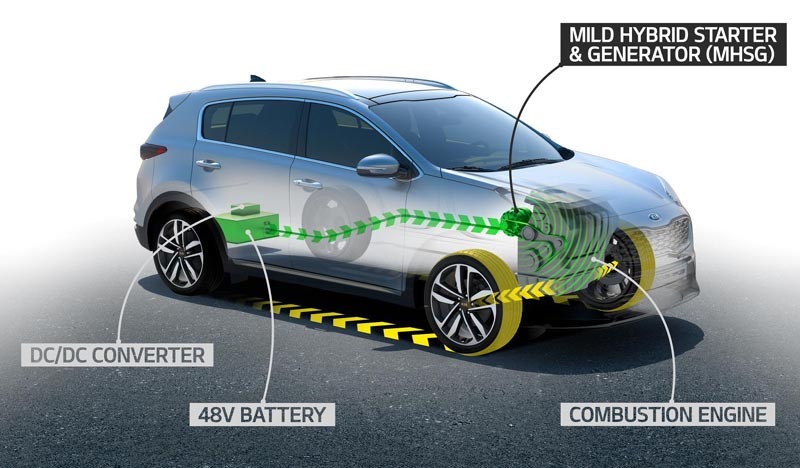 Kia’s EcoDynamics+ diesel mild-hybrid powertrain is compatible with both manual and automatic transmissions, and could be adapted for front-, rear- and all-wheel drivetrain layouts. The powertrain will also be adapted for use in petrol engines. Kia will communicate more detailed plans for the roll-out of its new mild-hybrid technology in the UK in due course.